Wilson, North Carolina was formed in 1849 when the villages of Toisnot and Hickory Grove merged together. Named for Mexican War hero Gen. Louis D. Wilson, the new town came to be known for agriculture and education. The Wilson of today holds fast to its roots, offering antique shops laden with treasures from all walks of life and nationally recognized historic districts brimming with remarkable structures, significant styles of architecture, and numerous locations to taste the famed Eastern North Carolina style of barbecue. 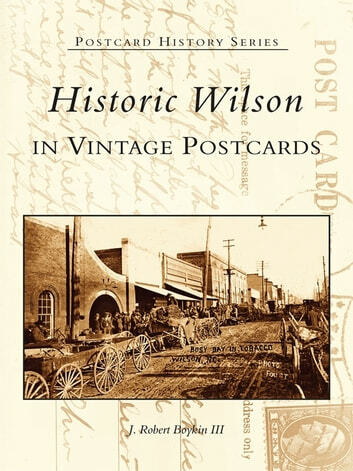 Historic Wilson in Vintage Postcards is a priceless collection of images that depict, among other views, the Wilson Depot from the late 1800s, local businesses, street scenes, churches, cotton and tobacco, and residential areas. The volume also affords readers postcards of Nash Street when it was considered "one of the most beautiful streets in America," tobacco scenes when Wilson was "the world's largest tobacco market," and the infamous 1911 trial of the Lewis West gang.